Spoilers if you haven’t caught last night’s Walking Dead Season 6 finale yet. The episode was a doozy, so if you haven’t, yet, get on that! The Walking Dead threw fans through a lot of emotional ups and downs during the show's sixth season. Obviously, fans who watched all of Season 6 know the series ended on a cliffhanger earlier this season when the aftermath of the “glenncident” wasn’t revealed for several weeks. With one major cliffhanger already happening last fall, you would think The Walking Dead might choose to avoid a large cliffhanger in the Season 6 finale. Ultimately, that theory proved to be untrue, as Negan and Lucille did show up, but we still don’t know who bit the dusk at the villain's hands. 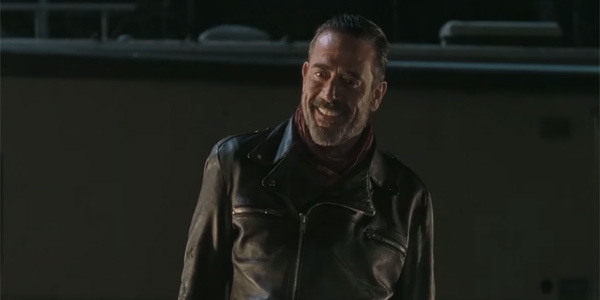 A lot of fans were frustrated with that ending, but showrunner Scott M. Gimple revealed on The Talking Dead that he knows the ends will need to justify the means. We have to do an episode that justifies it--the cliffhanger--to you. We have to do something so great and so intense that you’re like, ‘OK, all right, fair play.’ That’s the challenge that we have, and we’re going to do it. We’re going to deliver you something fantastic. Honestly, there were inklings on the interwebs that Season 6 might end the way it ultimately did before the episode aired, so the cliffhanger finale wasn’t a huge shock when it came. In fact, the ending is very reminiscent of the Jon Snow cliffhanger that Game of Thrones opted to use at the end of Season 5. The outcome means that we will be talking about the cliffhanger ending until the day The Walking Dead hits the schedule next fall. This has more pros and cons than it at first seems. Many fans have been frustrated with the POV we were given when Negan was finally introduced on the small screen and even used Lucille. The audience saw the bat swing down from the perspective of the person who was on the receiving end of the weapon, which is how we are able to know someone is dead or dying despite not knowing who that person is. Because the scene was pivotal to this weekend's finale, fans have already emotionally invested in the scene. Six months from now, the anticipation for that moment is not going to be nearly as high. Harkening back to Game of Thrones again, I think most of us can agree we are a little tired of talking about the Jon Snow thing at this point. If The Walking Deadwants to avoid fan fatigue, it means the show is going to have to deliver at the beginning of Season 7—and deliver in a huge way. As Scott Gimple also mentioned on the late night talk show, when we find out who was on the receiving end, the show will be kicking off an entire new storyline, which should help to make the moment momentous. When we reveal who’s on the receiving end, that’s going to be the start of another story. The other big takeaway on The Talking Dead that we got is that no one in the cast seems to know exactly where Season 7 is heading right now. On the bright side, AMC has already renewed the long-running drama for next year, so the creative team can get to work, knowing the budget and episode count is already cemented for the 2016-2017. You can check out all the details we know about the upcoming Season 7 with our what we know guide. Were You Frustrated By The Walking Dead Season 6 Finale?